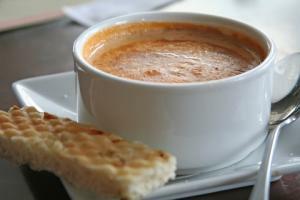 Lobster bisque is a well loved cooking with wine recipe. The sweetness of the lobster and the smooth texture of the dish compliment each other so well. The types of wine that can be used run from riesling to dry sherry, which is a classic combination. The following version uses Sauvignon Blanc, which gives it a tangy flavor, but feel free to use any of the various types of white wine. You will enjoy this uncomplicated recipe. In a medium saucepan saute celery, and onion in butter. When tender, add the garlic and stir together. Add the flour and cook for a minute or two. Add Half and Half and let simmer for about 5 minutes. Stir in clam juice, wine, and parsley, simmer for about 10 minutes, until the mixture thickens. Add lobster and cook another 5 minutes. Add salt and pepper to taste. Though this recipe calls for Sauvignon Blanc, feel free to substitute dry sherry, the nutty flavor of the sherry is great with this lobster dish.